The fact is that the battery is the most vulnerable part of a UPS. 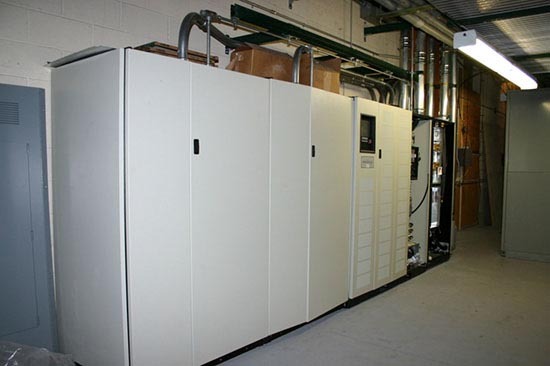 It is battery failure that is the leading cause of downtime and the reason to have a UPS maintenance plan in place. Having an understanding of how to adequately maintain and manage your UPS batteries will extend your battery life and go a long way in avoiding costly downtime. The most common battery that is in use is the maintenance free battery. These batteries are usually sealed in polypropylene plastic which does not contain any sloshing liquid that might leak or drip. Recombination of water is essential to their maintenance. Anything that adds to the rate of evaporation reduces the battery life; another reason that UPS maintenance is so important. The end of the life for a battery is when it can no longer supply eighty percent of its ampere-hours in its rating capacity. After it hits the eighty percent mark the aging process seems to accelerate and it should be replaced. There is some difference between large and small UPS. In most cases a small UPS will only have one battery where a larger UPS could have a multiple string of batteries. In either case it is important that there is UPS maintenance in place. Obviously the larger UPS will be more complicated to maintain. It must be monitored closely so that one bad battery does not take down the whole system. As systems get larger it is common for wet-cell batteries to be used. If you have batteries that sit unused and you have not included a charging regiment in your UPS maintenance plan their life will decrease. The lead-acid types of batteries have a self-discharge characteristic and it is recommended that they be charged every three months of storage. Without this regular charging you can expect that permanent damage will occur within eighteen to thirty months. To further prolong their shelf life they should also be stored at temperatures fifty degrees F or less. The most typical reasons that batteries fail are because of high or fluctuating temperatures. If there is a float charge voltage that is inaccurate could cause a failure. Having inter-cell links that are loose or connections that are loose could cause a failure. If because of drying out or a damaged case there is a loss of electrolyte this could cause a failure. General lack of UPS maintenance, UPS repair or aging can cause failures. All of these are reasons there needs to be a maintenance program in place. If you are looking to purchase a service plan you want to make sure you understand exactly what it is covering. Support agreements for large UPS models are likely to only cover internal electronics with the option of purchasing battery coverage. A strong plan will have comprehensive service coverage for your UPS basic electrical components, excluding the batteries. You can then purchase battery parts and labor coverage. The general held belief is that batteries should be replaced a minimum of every five years with a higher replacement time if they are frequently discharged or they are used in a warm environment. You may want to consider remote monitoring so that significant changes are caught quickly. This entry was posted in Uninterruptible Power Supply and tagged UPS maintenance, UPS maintenance plans, UPS repair. Bookmark the permalink.